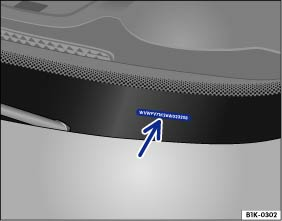 The vehicle identification number can be read from outside the vehicle through a viewer in the windscreen (arrow). The viewer is located in the lower corner of the windscreen. The vehicle identification number is also stamped on the right water drain channel. The water drainage channel is located between the suspension turret and wing. You have to open the bonnet to gain access to the vehicle identification number . Engine and gearbox code, paint number, interior equipment. In the example, the engine code is CCZB .